Pearls Vision Birch Lacquer series is now offering the next level in perfection with their most affordable 100 Birch drum kit. The Vision VBL features 6 ply 100% Birch Shells renowned for delivery a precise and naturally EQd sound. This kit will sit nicely in the mix in the studio and sound sweet on the stage. The perfect kit for drummers looking for a killer sound without spending a fortune. 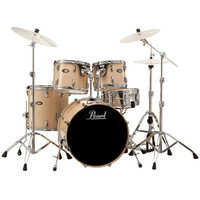 Best of all – Pearl even include their high quality double braced 900 series hardware!